There are reports that the Nokia 6 (2018) receives an Oreo update on first boot. Sounds great until you realize that Oreo was released almost five months ago. It also just reeks of a ploy to avoid Treble implementation. 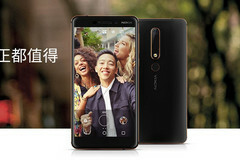 The Nokia 6 (2018) was announced a few days ago as HMD's first device of the year. Although the mid-ranger made a number of improvements over its predecessor, the first-gen Nokia 6, a particular item on its spec sheet stood out: the device shipped with Android 7.1 instead of Oreo as initially expected. One of HMD's unique selling points is their attention to software, so that move was rather unexpected. Even more bizarre, however, is the fact that reports claim the device receives an Oreo update on its first boot. There's an obvious reason for that, of course, as it's nonsensical to believe that HMD prepared two OS versions for the device without any incentive. Treble. The company, a few months ago, announced that it wouldn't be implementing Treble on its Oreo builds due to the lack of the required vendor partitions. Android Oreo has been out for close to five months now, though, so it's a bit hard to believe the Finnish company still didn't plan for the Treble implementation process. Treble, one of the features most sought after, especially by enthusiasts, is supposed to offer a greater chance of software support to devices. HMD, admittedly, already has one of the best records of support, probably only second to Sony, but this still feels like an attempt to weasel out of Treble, as devices launched on Android Oreo are required to have it implemented. The OnePlus 5T already launched on Android Nougat after Oreo was released but the company isn't exactly a model of virtue these days, so that's almost expected. HMD, on the other hand, has looked quite attentive to fulfilling consumer needs, so this comes as a surprise. That said, there's a chance this becomes a norm, at least for devices released within the next few months. It's sad that the ecosystem lends itself to practices like this, but c'est la vie, mon ami.